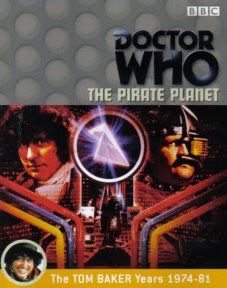 ‘The Pirate Planet’ scripted by Douglas Adams represents Doctor Who at its most ambitious, its sprawling and epic script bursting with clever ideas and concepts. With a seamless blend of science fiction, realism, and absurdity, only the four-episode running time and one unfortunate performance keep this second story of the Key to Time season from reaching its full potential. The pirate planet itself is an absolutely ingenious concept that works incredibly well within the confines of Doctor Who and its budget, tying several loose threads together naturally without ever indulging in how clever it is as a narrative device. In fact, every plot point introduced is fascinating, but the search for the Key to Time segment as well as the pirates, the planet’s queen, and the telepathic sect all end up being less developed than they might have been in a script with fewer elements in play. It’s tough to fault the ambition of Adams here or to cry foul when each of these ideas is incredibly strong, especially since the resulting pace is fantastic, but there is easily enough content here for a six-part adventure with minimal padding. The major point of contention for ‘The Pirate Planet,’ though is the performance of Bruce Purchase as the Pirate Captain. While the dialogue does set the character up to be a rather larger-than-life figure, the performance veers far into over-the-top and near-pantomime territory. His power and menace is never in doubt as he mercilessly reminds everyone beneath him with random threats and acts of violence, but a more tempered performance could have resulted in a much more impactful and well-regarded foe. Given that he is such a prominent figure, vast segments of ‘The Pirate Planet’ are difficult to view without waiting for the next scene or hoping for someone else to speak. Fortunately, Tom Baker’s Fourth Doctor is on top form, ready to give as good as he gets and always ready with a quip to at least make his exchanges with the captain enjoyable. Fortunately, the script can overcome Purchase’s overacting by deftly linking its strong ideas with deep emotional resonance. A predacious planet with completely unaware inhabitants reaping the benefits of its actions is masterful, but the deeper concerns about strangers and even asking why being forbidden quickly gain prominence as the truth behind this seeming utopia is brought to light. The Doctor pointedly asking how this can be allowed to occur given the vast price incurred astutely calls into question the morality of those involved given the tremendous consequences that result. Although some special effects don’t quite stand up as well as others, the location work does add a nice sense of scope to proceedings, and the developing relationship between Romana and the Doctor as both begin to confide in each other hints at a much more dynamic team in upcoming episodes. The Key to Time segment again feels like an element that needed to be included simply to keep that arc progressing as well, but it’s quite inconsequential in the grand scheme of things. Instead, for those able to look past the bombastic overacting of the captain, ‘The Pirate Planet’ offers an immense experience highlighting the scope and ambition of the show in the hands of a very confident writer brimming with ideas.